Each block comes with multiple sort options among which you can find the 7 days post sorting option. This sort option will display the most popular posts from the last 7 days. The ranking is made based on the views recorded on each post. To enable it on a block, you have to open the block settings panel and look for the Sort order section. Open the tab and select the Popular (last 7 days) sort option. Save the settings. Note – The functionality of this feature depends on the setting from Theme Panel. Check the instruction presented below to see how you can activate it. To enable the 7 days post sorting feature, you have to use the switch located in Theme Panel > Block Settings > 7 days post sorting. When you enable this option, a new sorting option will work and it will be available on each block (popular – last 7 days). 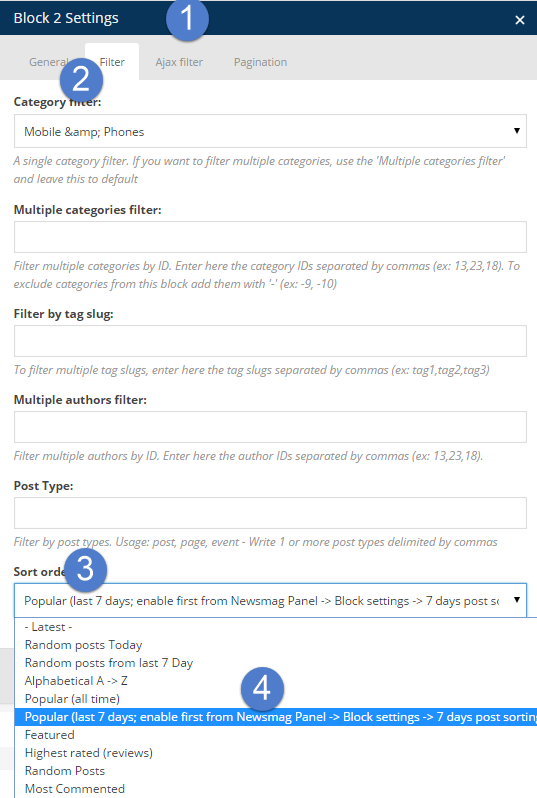 This sorting option will pick posts that are popular in the last 7 days, ordered by page views. This option comes with a small performance penalty and it does not work well with caching plugins yet. Note: When caching is enabled, the sorting will be an estimation of the popularity in the last 7 days.